Shirt or Dress? 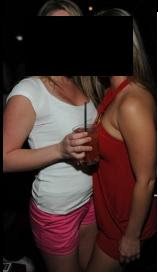 : Who wears hot pink shorts to the club??? Girls who hang out with no-pants-wearing girls, that's who! Who wears gym shorts to clubs? Now I finally see the prove! Her friends are all dressed up, why would she wear those gym shorts?? They are pretty awful.